I lived in Palm Springs for a few years, and was so sad to see that the legendary ‘Fabulous Palm Springs Follies’ closed in 2014, after a 23-year run. Although you can’t see those over-the-top vaudeville-style shows, it’s a good place to start a description of what Palm Springs is like. Just like any other Ziegfeld or Vegas showgirl, the Follies showgirls wore mile-high feather boa’d headdresses, fantastically bright and skimpy costumes, adorned with pearls and rhinestones a-plenty. The only difference is these showgirls were all aged 55 to 84. I even saw one showgirl in her 90s doing cartwheels on stage once. In heels. See why they were ‘Fabulous’? So, this is why the Fabulous Palm Springs Follies epitomizes Palm Springs. While others may aim to age gracefully, here it’s all about aging Fabulously. In its 1950s-1960s Rat Pack heydey, the rich and famous (and Fabulous) of Hollywood all built vacation homes out here in the desert. I highly recommend you take a tour and see the former homes of Frank Sinatra, Bob Hope, Liberace (called ‘Piazza de Liberace’ of course. What an experience that was!) and the Honeymoon Hideaway of Elvis and Priscilla. So because of that mid-century building boom, Palm Springs is also known for incredible, gorgeous, stunning, space age-y mid-century modern architecture. Hyperbole totally warranted here. Here’s a great Palm Springs Architecture Tour to try. From the Ship of the Desert, where designer Trina Turk lives, to Palm Springs City Hall, there’s even a famous mid-century modern gas station here, for heaven’s sakes. There’s also Palm Canyon Drive, and El Paseo, known as the Rodeo Drive of Palm Springs (see? I told you it all goes back to Hollywood). 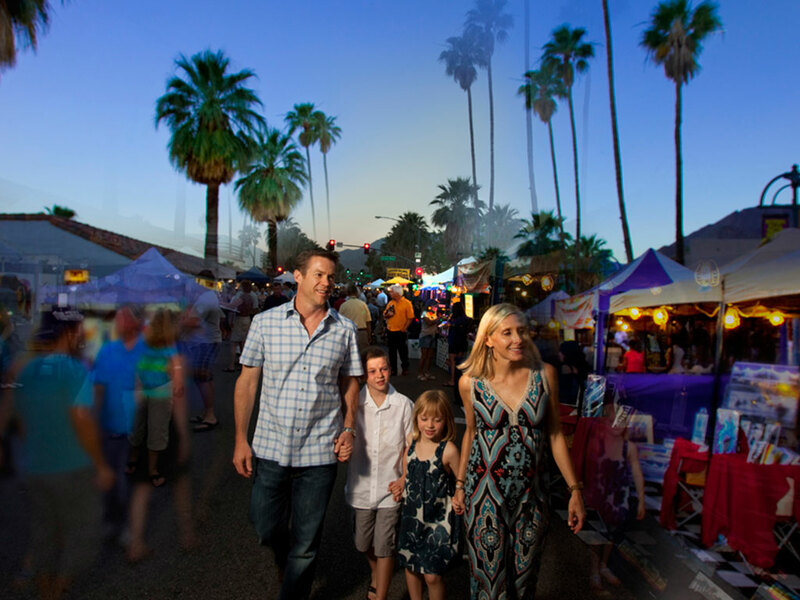 Don’t miss Palm Springs VillageFest every Thursday night, when that desert sun mercifully sets, and you can stroll with your family down Palm Canyon Drive through hundreds of arts and crafts booths, with plenty of sidewalk cafes to choose from. This is also a great spot to do some people-watching. You never know which Hollywood-turned Palm Springs Fabulous celebrity you might see. Take a break from the bright lights of Las Vegas, and opt for a scenic drive across the desert about 35 miles south to the Arizona/Nevada border and Black Canyon. Here you’ll find a National Historic Landmark that weighs, oh, about 6.6 million tons. Known as the Eighth Wonder of the World: The Hoover Dam. At 726 feet high and stretching 1,244 feet across the Colorado River, it was the largest dam in the world at the time of its completion in 1935. When you see it for the first time, you will be in awe. In the 1920s, the US Government devised a plan to harness the power of the mighty Colorado River, to provide water and hydroelectric power to the Southwest. And there was a very important bonus to this massive undertaking: to provide much-needed jobs after the Depression. And here’s what you’ll appreciate about those incredibly tough working conditions: Facing strict time deadlines, workers often dangled from heights of 800 feet to clear canyon walls, toiled in 140-degree tunnels choked with carbon monoxide and dust, all for wages of about 50 cents an hour. 112 workers died while building the Hoover Dam. You’ll see their memorial at the top of the Dam by artist Oskar J.W. Hansen, with an inscription that reads: “They died to make the desert bloom”. Today, The Hoover Dam is a National Historic Landmark, and you’ll be wowed by both the engineering marvel of the dam and the incredible heroic and mythical artwork here that commemorates it. You can walk across the dam and look down, down down. You’ll be standing atop more than three million cubic yards of concrete. And at a height of more than 725 feet, it will give you a real appreciation of how deep the river was at this point. The style of this dam was built in an arch-gravity style, in which the water load is carried by both gravity and the shape of the arch. Wow. Starting to see why it was called the Eighth Wonder? There are a couple of permanent ‘guards’ for the Hoover Dam. Near that Workers’ Memorial, you’ll see more art deco sculptures and celestial symbols by Oskar J.W. Hansen. The two soaring, 30-feet tall Egyptian-inspired guards are called the “Winged Figures of the Republic”. They’re set on a terrazzo floor, inlaid with a celestial map, and compass with the word ‘Alcyone’. Oooh, what does it all mean? Well, Alcyone is a star, and the massive map you’re standing on represents our galaxy, with the sun at the center. It all points to a specific place and time: the day President Franklin D. Roosevelt dedicated the Dam: September 30, 1935, at 8:56 pm. So cool. Next, time to go underground. Deep, deep underground, 500-feet to the base of the dam, and see what it was like for the workers back in the 1930s. You’ll get to see some of the preserved tunnels, then you’ll get to tour the power plant. Each wing is the length of two football fields, and those massive turbine generators are several stories high, and they produce 4 billion kilowatts of electricity a year. Eighty years later, and this is still one of the country’s largest hydroelectric power facilities. You’ll see these some of those massive turbine generators that produce all that power. Now, as impressive as that is, if you have an eye for art, look down at the beautiful and intricate designs embedded into the terrazzo floors. Yes, it’s always a good time to check out the interior décor. The creators of the Dam knew that this was a project for the ages, and that it shouldn’t just serve a utilitarian purpose. So, they hired artists to come in and spruce up the place, and to create works symbolizing the importance of this engineering marvel. One of the artists was Allen Tupper True, whose floor designs symbolize both Native American visions of nature, animals and the Southwest, but also the integration on this massive structure. Nature and man-made marvels uniting as one. 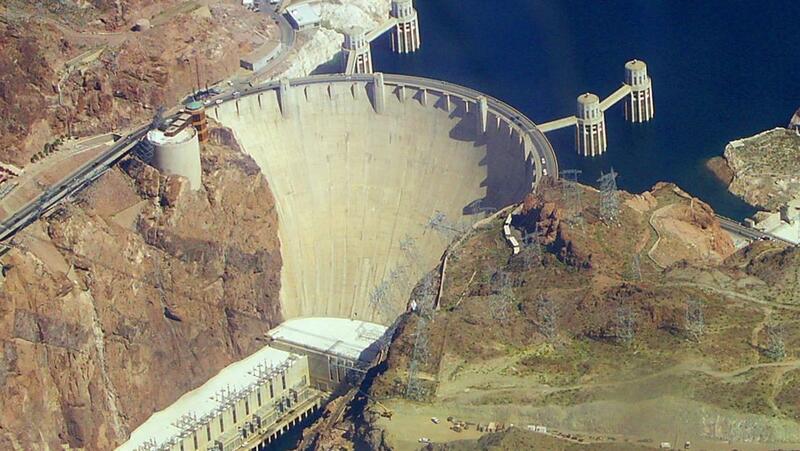 The Hoover Dam created Lake Mead, our next Desert Hot Spot. It extends 110 miles behind the dam, holding approximately 28.5 million acre feet of water, making it the largest man-made lake and reservoir in the United States. And the best way to experience it is on a houseboat. Most houseboat rental companies offer three, four, five and 7-day trips. How long should you go? My favorite bit of advice is: How long can you stand being locked in a hotel room with these people? Because remember, the only way to get some quiet time on a houseboat is by jumping overboard. And 110 miles is a long way to swim. Actually, vacationing on a houseboat is a fantastic experience. You’ll have the freedom to go at your own pace, get up close to incredible nature, all within Lake Mead National Recreation Area. You can boat, fish, swim, and when you need to get back on dry land, there’s nine main wilderness areas, with plenty of spots to stop and hike, picnic and learn more about the thousands of desert plants and animals here, who have all had to adapt to this hot and dry climate. You may see species you’ve never seen before: If you’re lucky, you may even see Desert Bighorn Sheep or a Mountain Lion. Other not-to-miss sites are the abandoned mines and historic St. Thomas. Or there’s always my favorite activity: sitting on the boat, floating by at a leisurely pace, and taking in the spectacular views of the lake and canyons. Hard to believe this natural setting is man-made. Some might call it the Eight Wonder of the World.